The biggest stock-market point drop in U.S. history happened in February and everyone pointed fingers at machines. Algorithmic trading, where proprietary computer programs can perform thousands of trades per second, were largely to blame was the consensus across many of the financial outlets. As we look over the news coverage in the biotech space, yes, surely some stocks suffered (and rebounded) but something else piqued our interest. Several longer-form articles, beyond the automated briefs produced by Thomson Reuters and Bloomberg, which mentioned our clients’ share movements appeared somehow incongruent – the titles may have seemed provocative but reading on, the articles became very general, reciting common known market facts and then veering back toward a specific company without an obvious segue or connection. The tone was off too. Were these articles written by real people or should we be pointing the fingers at machines here too? A January 18, 2018 article in Techemergence outlines the applications of AI at major media outlets, such as the The New York Times or BBC. Most of the article refers to how AI is speeding up editorial research and can support data mining, but it also goes on to describe how the Washington Post is using “robot journalism” or “automated journalism” programs. During the 2016 US election, the program, Heliograf, was used to provide detailed coverage of the nearly 500 contests across the US using templates and pre-written previews to automatically update stories as election results came in. The paper has also been trialing Bandito, a headline testing software tool. A January 15, 2018 report from the World Economic Forum in Davos with the main title “Can you tell if this was written by a robot? The report starts by explaining how Wordsmith from Automated Insights bills itself as a software that ‘automatically generates narratives on a massive scale that sound like a person crafted each one’. 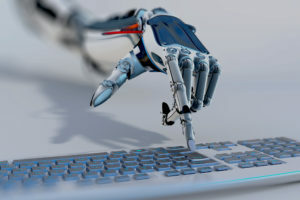 The Associated Press is referenced as being a user of Wordsmith “to transform raw earnings data into thousands of publishable stories, covering hundreds more quarterly earnings stories than previous manual efforts.” Further in the report, the co-founder of Narrative Science predicts up to 90% of articles will be written by AI within 15 years. While reading just a couple of reports didn’t enlighten us as to whether the articles on our clients where machine or human created, there does seem to be a high likelihood, given the advances of creative AI in recent years, they probably where. And if written by machines, are they more or less worthy of consideration, especially if they hint at a stock recommendation? And are we moving towards a time when machines dominate the buying/selling of stocks influenced by news articles that were also written by machines?